The Iron Man story from tails of suspense # 57 is the first appearance of Hawkeye. You may not know -the now famous Avenger- started out then as an adversary for Iron Man. With motivations rooted in jealousy, and an attitude that’s more selfish and egotistical than selfless, is how Hawkeye debuted. It’s more than just his character that leads him down the path to face off against Iron Man. But a twist of fate and a chance meeting with the Black widow – and already established Iron Man arch nemesis. She through her beauty and seduction, takes the selfish -and possible hero to be- Hawkeye and leads him to face-off against Iron Man. With Hawkeye having high hopes of earning black widows love, a new character and a now long established connection was born. Artistically speaking I feel Don heck did well in this Iron tale. From the well illustrated opening splash; The emotion and expression Tony Stark, happy Hogan, and Pepper Potts’s faces; To the dynamic flow of the battle between Hawkeye in Iron Man. This issue felt consistent in right. To elaborate further we can take Happy for example: Happy Hogan, whom the greatest irony never looks happy. In addition to expressing great sadness is also amazingly able to expressed joy. This is a testament to successfully illustrating the character. Then we have the battle between Iron Man and Hawkeye. The feeling, flow and poses all seem to fit. 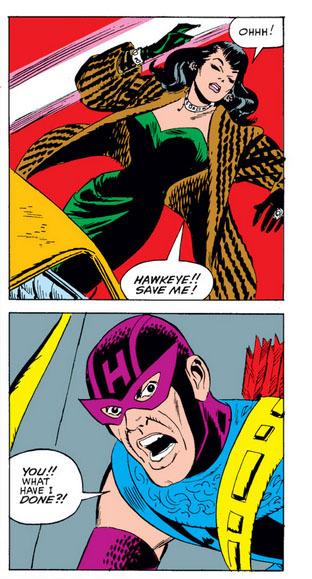 Possibly in part due to how well designed Hawkeye was. In any case the battle scene scene the flow naturally from start to its conclusion. This issue seems to flow well with the continuity from Tales Of Suspense #53, where we last seen Black widow. It as well fits in with the recent developments we have seen with the Love Triangle between Happy, Pepper, and Tony. But it takes that simple triangle, and makes it more complex, both by offering us the first real signs of Tony being willing to go out with Pepper; to the belief by Hawkeye that Black Widow has an interest in Tony Stark. With this we see, how well continuity can flow into originality in this classic comic book tale. I feel that Hawkeye is off to a good start, from design, to attitude. More self moderated then pure villain at this point ( in fact, he starts out trying to do good, it just backfires). But then corrupted into doing harm, for the love of the black widow. This is a concept we have seen before in and out of comics, but I feel it was done so well in this issue. This brings us to looking at the story as a whole, being well written, and built. It is hard to find criticism with it. In fact from the overall plot right down to the dialog and how well the artwork fit the tale, I am left wanting nothing more from this tale. In fact, I find myself looking forward to the next appearance of Hawkeye and Black Widow.